Three days after winning the NBA Championship, the Golden State Warriors were greeted by hundreds of thousands of hometown fans at their victory parade. 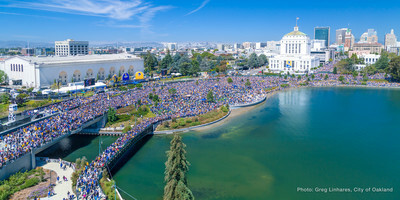 Hotels in Oakland were at capacity, downtown restaurants and bars were packed, and the rally was a perfect way to show off the Measure DD-funded, beautifully redesigned south end of Lake Merritt, including the new park area and amphitheater. “Everyone worked together to pull off a spectacular event,” said Special Events Coordinator Jim MacIlvaine. The City’s Police, Fire, Public Works, and Parks & Recreation departments and the Downtown Oakland Association all contributed to make sure the event came off without a hitch. Thank you, Golden State Warriors, for giving Oakland a beautiful celebration! Congratulations 2015 Oakland Indie Award Winners! The Oakland Indie Awards recognized nine Oakland businesses for their contributions to the city. Honored businesses include winners Café Gabriela and The New Parkway Theater, both recognized for their community support; legendary Chicago pizzeria Zachary’s for creating 100 jobs and being 100% employee-owned; vintage fashion boutique Regina’s Door; innovative newcomer Qeyno Labs; West Oakland arts community American Steel Studios; and boutiques OwlnWood and Concept 47. Downtown nightclub Geoffrey’s Inner Circle, now in its fifth decade, received the Pillar award for being a mentor and advocate for the African American business community. The Oakland Indie Awards is an economic development initiative of Beneficial State Bank and Foundation that encourages people to recognize the social, economic, environmental and political impacts of supporting locally owned businesses and local artists. For more information, contact Business Development Manager Aliza Gallo. 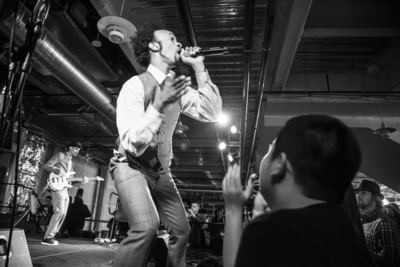 Oakland's own Fantastic Negrito headlines the Oakland Indie Awards ceremony. Art and technology company VSCO loves their new Downtown Oakland headquarters so much, they made the city the star of their recruitment video, betting that their Oakland location will give them the edge in attracting engineers with an arts bent and social mission. Oakland provided lots of content for VSCO’s online photography journals, leading to the production of a two-part Oakland City Guide. VSCO is not the only new company to rave about their Oakland location: Kuli Kuli founder Lisa Curtis penned this love letter on Oakland’s startup culture, stating, “If startups and small businesses are truly going to make the world a better place, they must have roots that resonate with that mission. And if any city promotes a culture focused on the triple bottom line, it's Oakland.” For more information on tech and startups, contact Economic Development Specialist Marisa Raya. New York-based L+M Development has partnered with Oakland nonprofit developer The Unity Council on the first part of a $116 million Phase II for the Fruitvale BART Transit Village, which is entitled for 275 residential units at 35th Avenue and East 12th Street. The East Bay Asian Local Development Corp., a local nonprofit affordable developer, is also working on the project. Oakland's Pyatok is the architect. The first building, Phase IIA, will have 80 affordable units and 14 market-rate units. Tenants making 30 to 60 percent of area median income will be eligible. Phase IIB, the final $70 million portion of the project would have 181 market-rate units and could break ground by early 2017, said Unity Council Executive Director Chris Iglesias. "A lot of the conversation is around development without displacement," he adds. "Fruitvale is a place where you can have both." For more information, contact Economic & Workforce Development Manager Larry Gallegos. 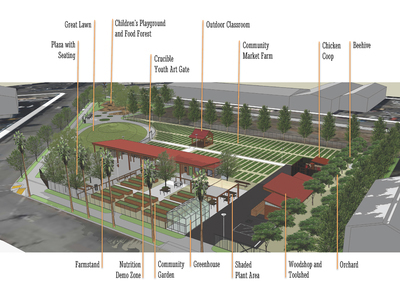 Farming nonprofit City Slicker Farms recently purchased 1.4 acres in West Oakland to develop a farm and park in the middle of a mixed industrial and residential neighborhood. Youth at neighboring industrial arts institution The Crucible will construct an entryway gate, while a greenhouse at the Ralph Bunche School fosters seedlings for sale and for the organization’s own use. Active since 2001, City Slicker says it has so far helped Oakland residents grow more than 219,000 pounds of food, including produce that is distributed at affordable prices through a weekly farmers’ market. Their innovative backyard garden program currently provides free supplies, volunteers to help build and plant new beds, two-year mentorships to novice gardeners and connects West Oakland youth with paid farming internships. For more information on urban agriculture in Oakland, contact Planning Manager Ed Manasse. With the implementation of new waste reduction services starting on July 1, Oakland businesses are now in a better position to comply with mandatory state and county recycling rules, and to help the City meet its Zero Waste goal by 2020. These new services apply to businesses across the city. For questions about new services or rates, contact the new Recycling Hotline at 238-SAVE (7283) or recycling@oaklandnet.com and visit OaklandRecycles.com. 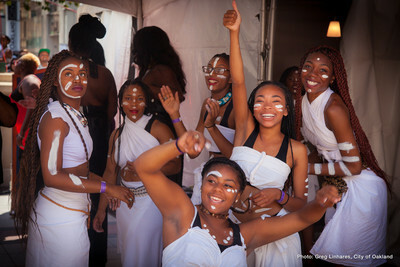 Oakland’s beloved Art + Soul festival – renowned for showcasing the best of East Bay music, art and culture – will host a big 15th anniversary bash in downtown Oakland on August 1 & 2. The incomparable Sheila E. headlines an all-star Oakland lineup that also includes The Family Stone, Lenny Williams, West Coast Blues Society Caravan of Allstars and Edwin Hawkins’ Gospel Showcase. Elevate Oakland, a local nonprofit supporting music and arts in the schools, will host a dynamic stage featuring Kev Choice, Martin Luther, 34-56 Band with Ashling “Biscuit” Cole, Ray Obiedo with Leah Tysse, Pacific Soul, D Sharp and Ryan Nicole. Returning this year are the 2nd Annual Oaktown Throwdown BBQ Competition and the festival’s three spell-binding dance shows: YAK to the Bay’s high-flying Turf & All Styles Dance Battle, the Oakland! Let’s Dance Stage produced by Carla Service of Oakland’s Dance-A-Vision, and a special performance by the renowned, Oakland-based vertical dance company BANDALOOP.